For all I love fountain pens, one of the frustrations of using them is that they run out of ink. So do other pens of course, eventually (and they get thrown away) but fountain pens need to be refilled regularly, especially if using them for sketching and cross-hatching! 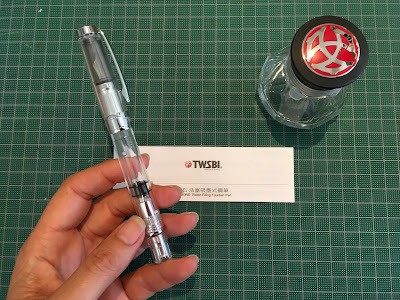 I carry small Nalgene bottles of ink with me when travelling or sketching so I have some on hand, but I've long been curious about the TWSBI pen as it has a massive (2ml according to their literature) ink capacity. I am using the TWSBI Diamond 580AL which is the largest of the series with the largest ink capacity. The Diamond 580 is identical, except that some of the parts that are metal in this pen are plastic in the 580 version, so it is perhaps 25% lighter. It also comes in a mini version that is shorter and slimmer. 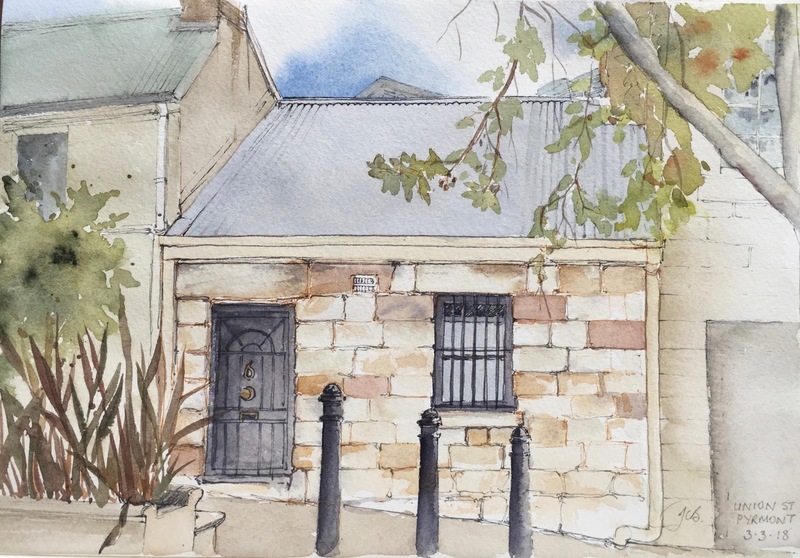 It's available in Australia from Larrypost, who specialise in all things pen, sketchbook, watercolours and ink. In the US I'd recommend Gouletpens.com. 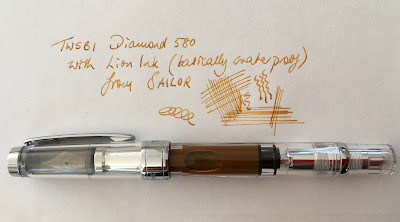 I filled the pen with a sample of Sailor Storia 'Lion' ink, a lovely golden brown ink, also from Larrypost. This is a pigmented ink so is fairly waterproof - an important consideration when sketching with watercolour. 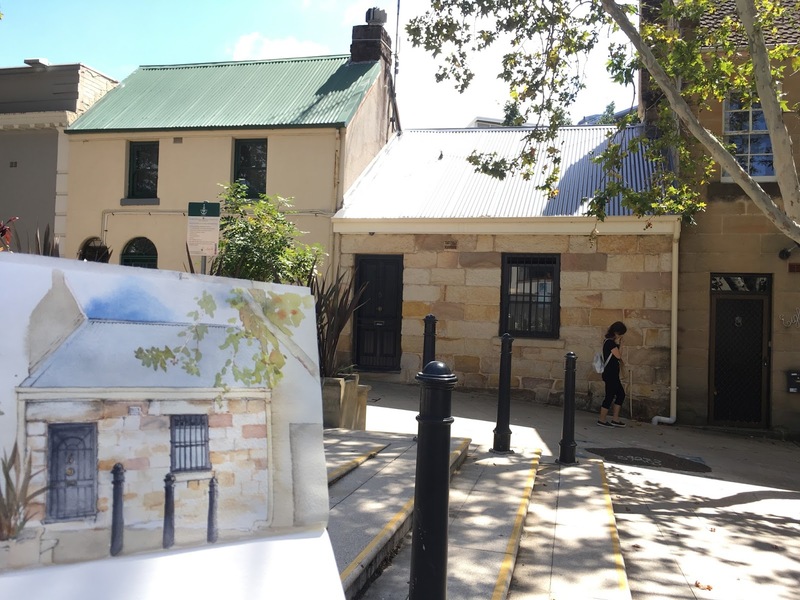 I wanted to use a fairly light colour to do the sketch for this sandstone building in Pyrmont. You can see the large capacity of this piston filling pen that works without a cartridge or converter. I have the Extra Fine nib, which always my preference as I really like fine lines. This is a Taiwanese pen with German nibs, so the Extra fine is not as fine as my Japanese EF nibs, but it is a really nice line width for writing or drawing - very like the Lamy. You can see how light the sandstone is in this picture, and why a black ink or even my usual dark brown or grey, would have been too strong. Completed with watercolour, the initial line-work almost disappears. Union Street, Pyrmont, ink and watercolour. I wanted to test out this pen for other purposes too so I've filled it with black De Atramentis Document ink - my go-to ink for drawing with fountain pens. I'll give it a run with the black ink in my diary and sketches and see how it goes. 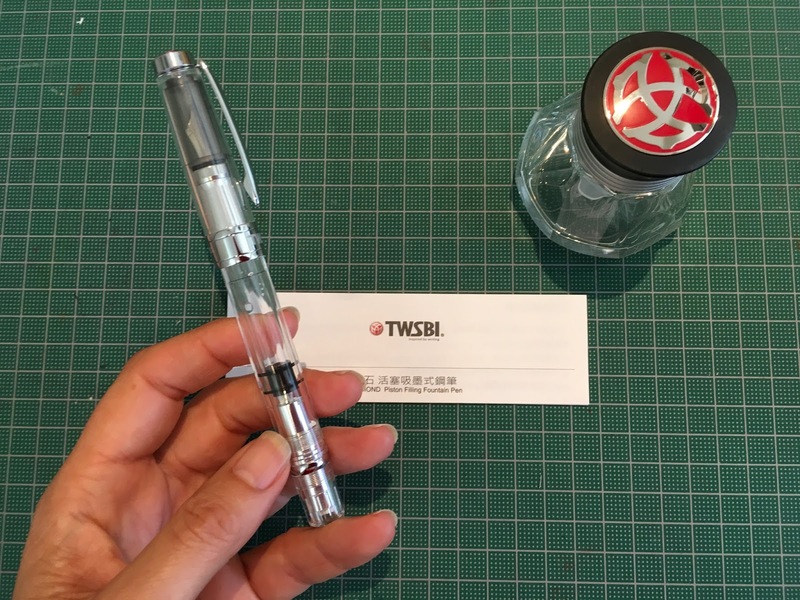 The TWSBI pen is also available with a gorgeous ink bottle that has a two-lid system containing a very clever filling mechanism. You can fill the pen without getting your hands covered in ink! You take off the top part of the bottle and the nib from the pen and fill the body from the beautiful and cleverly designed bottle. The special filling mechanism works with the TWSBI Diamond range, the TWSBI Classic range and also with the 'universal' converter so it is really nifty! Of course you can use fill any other pen from the bottle in the usual way. The TWSBI Diamond 580 pen and the Diamond 50 ink well. It is heavier (28grams) than some of the other fountain pens I've used, and quite thick in the barrel so it doesn't easily fit in the pen loop of my dairy. I usually use a Lamy Joy as it slots in very nicely. So I am keeping this one in a pencil case in my handbag. I wasn't sure whether I like the lid posted or not - it is heavier than the Joy posted but feels shorter un-posted. It is not strictly designed to 'post' - it sits on the turning screw that is used to fill and empty the pen rather than fitting fully over the barrel of the pen. The Mini version, however, does post normally. The Classic version doesn't post at all. Of course I don't post the Lamy Joy nib, but I often do with other pens. It's all about the weight and balance of each pen. Lines made with a Lamy and a TWSBI, both EF nibs. 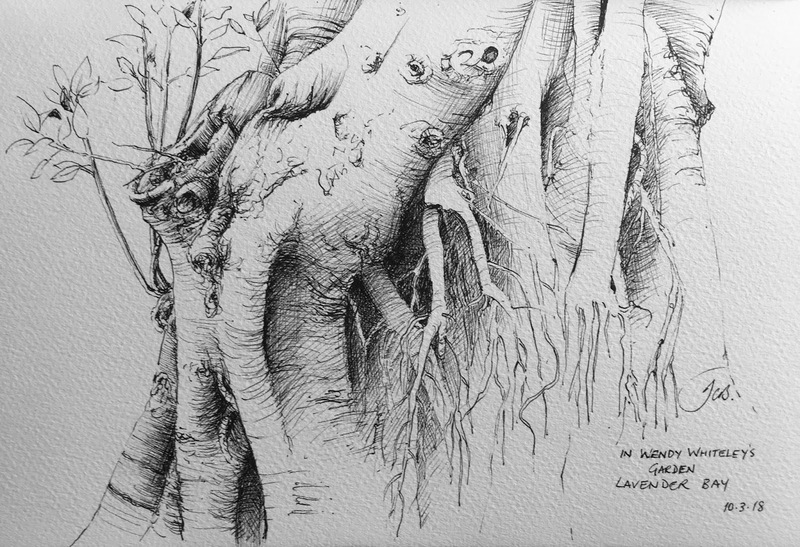 I ended up using it un-posted most comfortably when I took it out sketching on Saturday and gave it a proper run. It is a robust nib, not intended as a flexible nib, but there is a bit of line variation possible - press lightly and get a very fine line, press more firmly and get a darker and thicker line. Turning the nib upside-down also gives a fine line but any finer so I didn't really bother doing that with this pen. It ran very smoothly with the De Atramentis ink and I enjoyed working with it. It certainly didn't come anywhere close to running out of ink! And that is the big feature of this pen - ink capacity. If you write and draw a lot, it's hard to beat. Interestingly is also coped very well with the medium texture of this watercolour paper. The EF Japanese nibs such as my Sailor 1911 EF can struggle since they are so fine. A Moreton Bay Fig and Wendy Whiteley's Secret Garden, Lavender Bay, drawn with the TWSBI Diamond 580 pen and De Atramantis Document Black ink. The paper is Fabriano Artistico. November 2018 edit - TWSBI also make an Eco pen, which is almost the same to look at initially, but has a lightly narrower nib and is made with different plastic and without the 'diamond' stying; and the newly introduced Go, which is a spring filled pen at a very low cost. 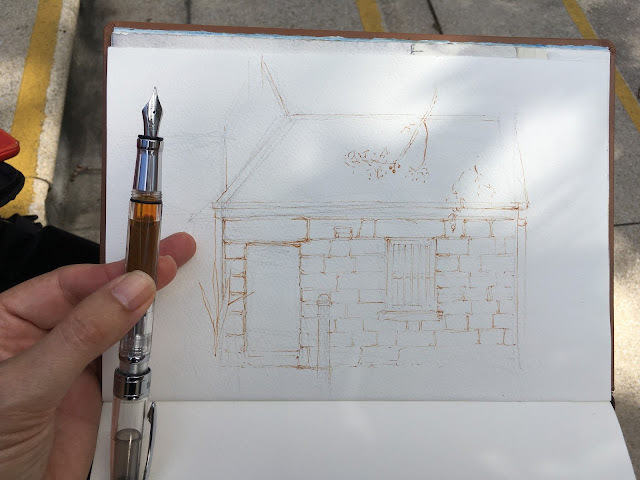 I'd recommend looking at the Eco as an excellent starter fountain pen for sketching. It is also lovely to write with. I'll add a blog post soon. Just checked and the pen is available in the U.S. on amazon in EF, F, M and B. Stub1.1 only in the Ego. The inkwell is also available. The Sailor Storia ink is also available in the U.S.
Have you used Noodler's Bulletproof ink and if so, what do you think of it? I have a few Noodler's inks, including the Bulletproof, but I haven't used it in a long time as it seemed to 'eat' two of my Lamy pens - the feeds were damaged - sort of melted. Consequently it sits in my draw unused. I've been told it's fine in other pens but don't want to risk it. I prefer De Atramentis Document waterproof inks. They seem gentle on pens, as well as being waterproof for drawing and watercolour. 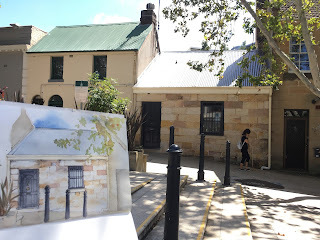 Da Vinci Watercolours and a Sydney workshop.